West of the Campsies, west of Mugdock, is a prominent range of low hills overlooking the bottom part of Loch Lomond and the Clyde and Leven valleys. This is reservoir land, and many of the shallow depressions between the hills have been dammed up to create artificial lochs. No roads go through the Old Kilpatricks and the centre part is almost trackless; but many old roads lead into it, and even older roads go around. 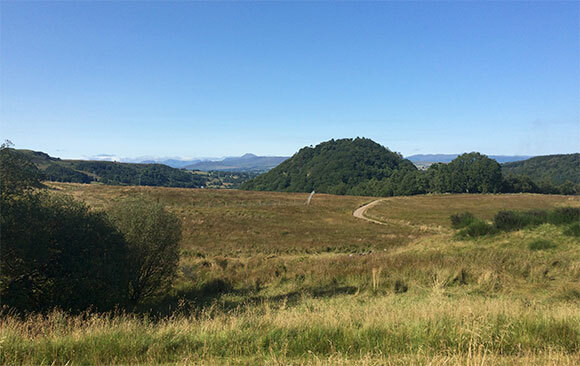 This route uses a combination of the West Highland Way, Sustrans 7 and the Forth-Clyde Canal to make a 75km loop around the Old Kilpatrick range, mostly avoiding busy roads. Sustrans 7 or NCR 7 is a meandering long distance cycle route from Sunderland, which is somewhere in England, to Inverness. The mapped route picks it up at Drymen, after a loop into the town which has an excellent coffee shop. The ride southwest from there along minor roads on the north side of the Old Kilpatricks to Balloch Castle is a treat; rolling hills with fine views south of the Kilpatricks. Balloch Castle is now a country park; a rolling descent though the grounds leads to a bridge over the River Leven, a strange and formerly very pretty little river draining Loch Lomond into the Clyde. I say formerly; they built Alexandria, Renton and Dumbarton on top of it. Heading north on the West Highland Way toward Dumgoyach, an old volcanic cone, with Ben Lomond in the distance. But this is a fine ride. 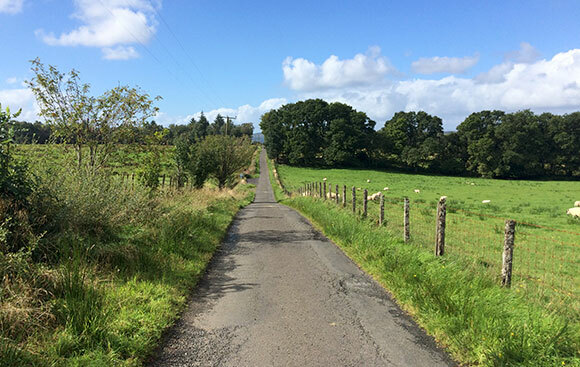 Glasgow to Loch Lomond and back again on a bike, beautiful countryside, no busy roads, and a circuit of the Old Kilpatricks. And let me tell you. Riding round the range is a lot more fun than riding through it. Read on. 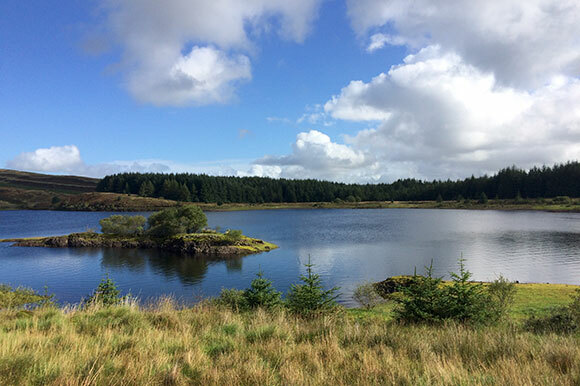 Damming projects started in the Old Kilpatricks in the early 20th century and after a few years a complicated series of interconnected reservoirs had been completed, filling up many of the smallish valleys in the range. Whether these ruined the water table and turned the range into a midge-infested bog, or whether it was always like that, Dodo doesn't know, but here is the data on the one bike trip I will make during this lifetime, into this unqualified dump. Access to the reservoirs is from the east (Auchengillan) and south (Cochno, and Old Kilpatrick village). The tracks that once connected some of them have largely disappeared, but the access roads from the perimeters to each of them largely still exist, except for the remote ones such as the Lily Loch. 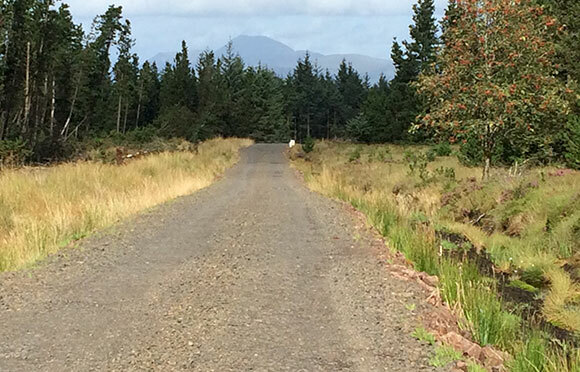 However over a single malt, Dodo looked at Google Earth and confidently pronounced a traverse was possible, taking the Burncrooks access road from Kilmannan and then striking out south west along a forestry road visible from space with suitable equipment. Where this petered out, a short 3km semicircular route cross-country looked feasible, southward, aiming for Greenside Reservoir, which has a gravel access road. Even if missing the reservoir, there are two others close by, one on each side, both with access roads. How hard can this be? See picture below. The ride up through Mugdock and Carbeth to Auchengillan was uneventful, an excellent whet on a restless but spirited day on the sweet forest tracks in the country park. The day was heavy and close, but a gentle cool northerly and a brisk pace dried away the worst of the sweat and kept the insects at bay. Birds sang in the trees. Squirrels sat on the stone walls noisily shelling nuts. The morning mist was rising and the sun began to burn through a little; the road steamed. Life teamed and bubbled from everywhere. A new and beguiling route into the hills beckoned, promising to reveal old mega-engineering projects and mysterious blue bodies of water hidden behind them, high in the hills. It was less than 3km away now. The blood was up. Burncrooks reservoir is only really pretty from its western end, or from the air; the access road gets you only to one end of it, and there's so little elevation you can't really see it. 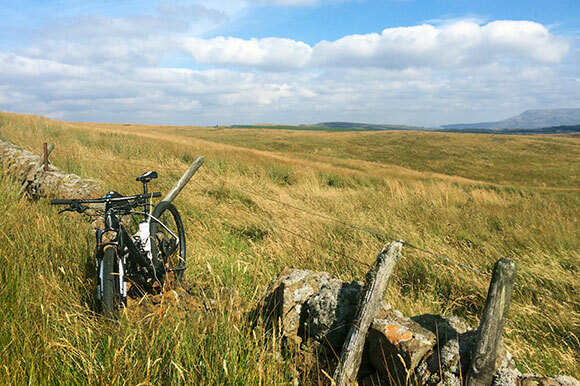 Undeterred, Dodo rode southwest, between Burncrooks and Kilmannan reservoirs on a fast, sweet forestry road being clearfelled, unfortunately... but this is land management in Scotland today. The knuckleheads operating the heavy machinery shouted, slavering, at me as I whizzed by; they got as good as they gave. I suppose it's a good trade for them; there's no-one else up there to hurt, but I wouldn't go hiking in there. Riding away from these dribbling bollock-draggers - at some considerable speed - I was curiously struck by an image of them similarly employed, but with hand tools only; chained together and forced to sing. A warm feeling came over me as I powered away from Kilmannan and hit the long incline up to the treeline. At that point, the nice gravel track disappeared. 3cm later, my front wheel sank into a bog worthy of the west of Ireland. The grass - that's kind, the reeds - rose up to about my thighs. As I stood on tiptoes peering south at an otherwise featureless rings of shallow hills, a strange faraway rumbling noise gradually claimed my attention; a vehicle was approaching. Turning, I found that it was some sort of heavy machine, grunting up the track, crewed by my toothless friends from further down the valley. "Hmm," thought Dodo, "what business might they have up here - except I?" Judging by the speed they were making, and the amount of smoke belching out of the thing, they may never have made it up that high, but in any case I set off squelching across the marsh in the general direction of the nearest small, rounded hillock, on which grew a number of stunted trees. They were small, but looked brandishable. "If they follow, I shall face them on my own ground," thought I, "where I have the advantage." These were Glasgow nyaffs; not your common or garden variety. I climbed the small hillock and found the trees to be a sort of dwarf pine, and diseased. "So much the better," I said aloud, breaking off a branch. "I shall sharpen this using a $12 Wiggle bike multi-tool, denounce them from this very spot, and, if I have to, pierce their very hearts with it." Looking back however, I saw no-one, and could no longer hear any vehicle; I assume it broke down, and for all I know there are there still. So, to other problems: I was stuck in a foul boggy marsh among rolling hills, unable to ride, with the grass now man-high and no view to the horizon in any direction except back the way I came. By this point, I was much closer to Greenside than the distant Burncrooks, so I hoisted the bike over my shoulders and waded southwest, aiming for an indistinct gap between two low hills. This was the worst decision I could have made - straight through the boggiest part of the range, where boulders coming down from the hills in some past epoch had sunk into the bog and accumulated several cm of moss on top of them, the whole now invisible among the reeds. Put your foot on one, and it will slide off and sink calf-deep into the mud around it, and over you go with the bike. It was torture. 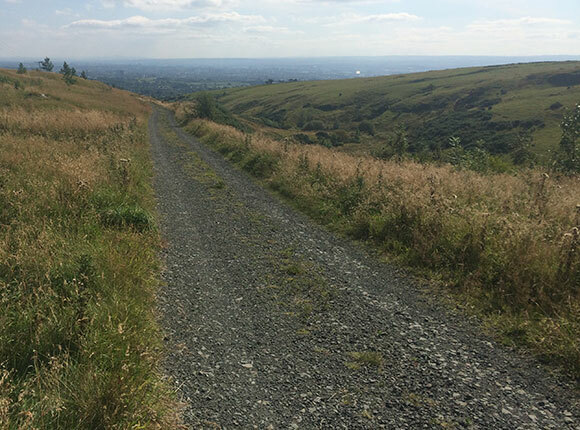 I reckon that 3km section took an hour and a half, and I only began making real progress when it dawned on me that the steepest sections on the sides of the hills would be least boggy. So I sidehilled them, carrying the bike, and finally staggered up to the top of the highest thing around, a place so inconsequential it doesn't have a name. I sat there thinking of a few, and managed to perform some bodily functions on this disagreeable spot before splashing off south downhill along a fenceline. Soon I was able to ride, but it was still hellish. The front dug in regularly and, twice, I was unhorsed. Eventually I located a patchy track following the Burnellans stream to Greenside reservoir, and followed this incredibly narrow goat track round the loch to the dam. Greenside is an unremarkable, reedy flooded field that looks more like a burst river in the south of England. The sort of place where people buy houses and then complain, when it floods, that it's the government's fault; the fact that they have bought a house on a flood plain being, in the moment of chicken roosting, not salient. I stood on the dam and couldn't think of anything to say; but to be sure we understood each other, I shouted at it anyway, before turning to see a number of people standing by some SUVs in a gravel car park. Pity was exchanged on both sides, then I took to the access road down to Cochno - on any other day it might have been a fine descent to the Clyde valley, but today it seemed thoroughly unsatisfactory - and picked up the canal to head back to Anniesland. Some time after the above adventure, Dodo returned to the Old Kilpatricks, tempted by the new John Muir Way track from Auchengillan to Burncrooks reservoir, then north through plantations to the old Merkins Road and out to Balloch. 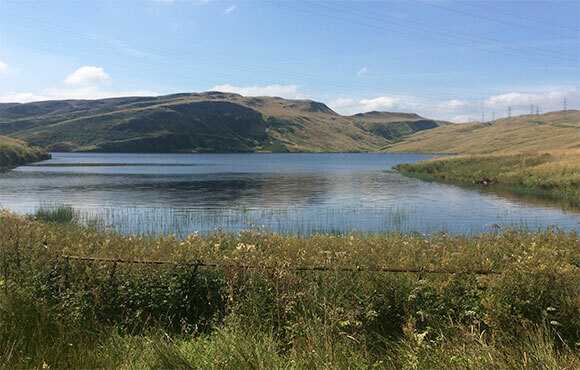 This route is for walkers and mountain bikes; the John Muir Way has an alternative route for road and touring bikes which bypasses the forest and reservoir and uses a scenic old surfaced road to Craighat; the same road used by the first route on this page. 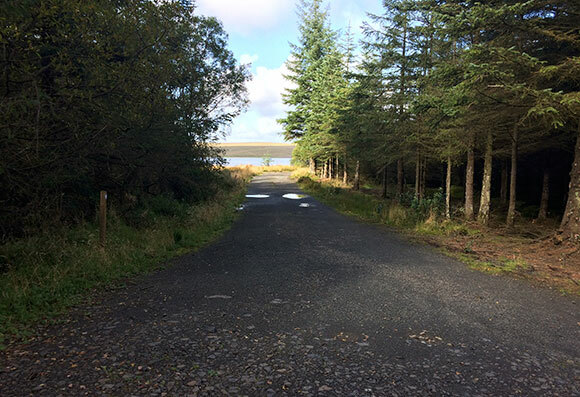 The route leaves the A809 at Auchengillan and heads west towards Burncrooks on the reservoir service road; take the signposted left turn just before the reservoir, then a right turn a few hundred metres later down to the water's edge. The John Muir Way has been around for a while, but the section through the Old Kilpatricks is a new venture. On the plus side, it provides an attractively unboggy path round the extremely pretty Burncrooks reservoir, and the even prettier lower (former) river valley, then north through a section of forest which is otherwise only accessible on forestry service roads. On these, if you are not fortunate, you may encounter the unhappy combination of indecorous fellows and heavy machinery (see above). So the path is a good thing. It must, I'd say, have cost a fortune to build - the entire section through the Kilpatricks is made of palm-sized jagged stones which must have been trucked in at vast expense from somewhere. They can't be very nice to walk on, and are horrible to ride on, but at least the drainage is good. Here's the problem: like many modern "constructed" paths, the thing has been built with seemingly no attempt to follow any kind of plan - it doesn't seem to prioritise either a direct line, or retaining gained height, so it just randomly follows the coastline of the reservoir and dives down into every bay. Yet it doesn't actually get to the coastline at any point; you have to bush bash to do this. The amount of wasted effort is huge, for walkers and bikers. To those using it for exercise, this is not a bad thing per se... but it doesn't make this path a particularly efficient way to cross the Kilpatricks. The irony, though, is that although the path is named for a renowned conservationist, a man ahead of his time in preserving the natural world, riding it (or walking it, I'm sure) is a curiously artificial experience. The highlight of the ride is the section once you reach the dam, where the path turns abruptly north along a low ridgeline overlooking the former river valley across which the dam was built. It's truly beautiful, a perfect river gorge full of rowans. From here, there's a more-or-less continuous descent through the forest on a mixture of new trail, service road and old double track to the old Mertons road. Descending the forest service road toward the Mertons farm, with Ben Lomond looming in the distance. Dodo did this ride on an XC bike, and reached extraordinary speeds on this section, severely frightening much wildlife. Note: this is an adventure road. Main photo: Kilmannan reservoir looking east. If you are foolish enough to attempt this ride, turn back roughly where this picture was taken.